In the Later Han Dynasty in China (AD 25-220), “Tenko” (a celestial hand drum), a child given to the couple of Ōhaku and Ōbo, has a mysterious background story. His mother, Ōbo, had a dream that a hand drum fell from the celestial world and resided in her womb when she was pregnant with her baby. Soon after Tenko was born, a hand drum which makes unbelievably ethereal sounds actually fell from the celestial world Tenko was raised with this hand drum. The sound of the celestial hand drum was exquisite and moved people and filled them with joy. The rumor about the hand drum reached the Emperor, and His Majesty called for the drum to be brought to him. 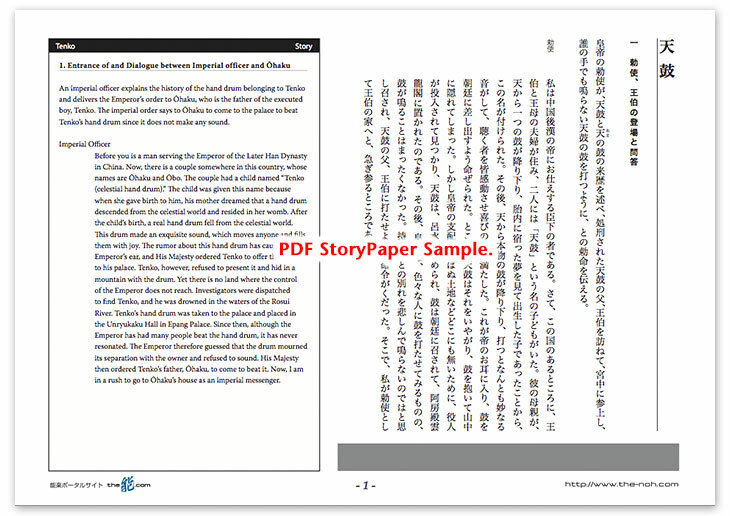 However, since Tenko rejected his request and hid with the drum, the Emperor captured Tenko and drowned him in the Rosui River. On the other hand, the hand drum was brought to the palace, and many musicians tried to play it. But it stopped making a sound perhaps due to the death of its previous owner, Tenko. Since no one can resonate it, the Emperor sends an imperial messenger to call Tenko’s father Ōhaku to have him beat the drum. While Ōhaku understands that if he cannot make the sound he too will be killed, he visits the palace and beats the hand drum having the love to his son in his mind. Then, the drum reverberates with a heavenly sound. The Emperor is impressed and rewards Ōhaku and sends him home. Then he decides to hold a memorial ceremony with orchestral music on the banks of the Rosui River in order to pray for the repose of Tenko’s soul. On the day of the memorial ceremony, when the Emperor visits the River, the ghost of Tenko appears and beats his fond hand drum. With the orchestra, he dances a spell with joy. The ghost of Tenko joyously dancing disappears in between waking and dreaming when day breaks at the first gray of dawn. This piece mainly describes the love and lament of Ōhaku for the loss of his doomed son, Tenko, in the first half. On the other hand, in the second half, it focuses on describing the free and vigorous spirit of Tenko, a mystic figure who plays with art. From the first half to the second half, shite changes from an old man to a child. 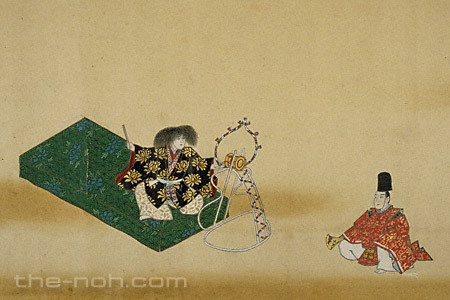 With this unique and dramatic contrast, the drama entwines another “Tenko,” the mysterious hand drum in its storyline. As the result, this piece was honed to an enchanting, highly artistic story. “Tenko” is another name for the Cowherd Star, which appears in the Star Festival (tanabata). Considering the mysterious birth of Tenko, he might be an incarnation of a celestial body. The ghost which appeared by the Rosui River is described as a spirit who is free from any worldly emotion, such as grudges or affection.